Passive Network Sensor | Qualys, Inc. Automatically detect and profile all network-connected systems, eliminating blind spots across your IT environment. Qualys Passive Network Sensor is available as a physical or virtualized appliance. It comes in two models — 1 Gbps and 10 Gbps — which can be combined to scale across different network topologies and sizes. Qualys Passive Network Sensor (PNS) continuously monitors all network traffic and flags any asset activity. It identifies and profiles devices the moment they connect to the network, including those difficult to scan, corporate owned, brought by employees, and rogue IT. The data is sent immediately to the Qualys Cloud Platform for centralized analysis. Qualys PNS enriches existing asset inventory with additional details, such as recent open ports, traffic summary, network services and applications in use. This helps customers gain a deeper understanding of an asset and its activity on the network in near-real time. Qualys PNS identifies assets that for different reasons can’t be actively scanned nor monitored with agents. That’s often the case with assets like industrial equipment, IoT and medical devices. 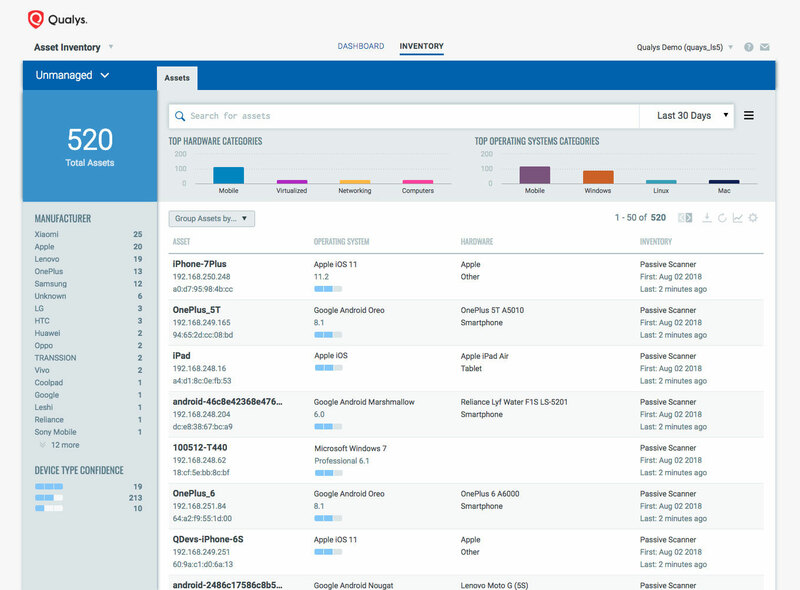 The Qualys Asset Inventory cloud app aggregates and correlates the data gathered by all Qualys sensors – Qualys PNS, the Qualys network scanners and the Qualys Cloud Agent – giving you a comprehensive, detailed inventory of all your hardware and software, as well as a multi-dimensional view of your global, hybrid IT environment. This visibility addresses the first two of the Top 20 CIS Controls: inventory and control of hardware and software assets. See for yourself. Sign up for the beta. Try the beta today. No software to download or install. Email us or call us at +1 800 745 4355.